NORTH HOLLYWOOD, CA – September 15, 2011 – What would life be like if the Nazis had successfully invaded and occupied Britain? Antaeus, L.A.’s multiple award-winning classical theater company, presents the U.S. premiere of Noël Coward’s rarely produced anti-war drama, Peace In Our Time. Casey Stangl directs the fully double-cast production of a new adaptation, with music, by Barry Creyton. Four gala openings, two with each cast, take place on October 20, 21, 22 and 23, with performances continuing through December 11 at The Antaeus Company‘s interim North Hollywood home at Deaf West Theatre. Creyton’s adaptation, which Stangl calls a “work of art,” adds emotional resonance to the original by adding nine of Coward’s lesser-known songs. Coward’s distinctive Music Hall style ditties with their incisive and wickedly ironic lyrics give the piece an authentic sensibility, at the same time offering audiences a deeper connection with the characters and their tribulations. Written in 1946, Peace in Our Time opened 63 years ago at the Theatre Royal, Brighton (July 15, 1947), moved to the Lyric Theatre, London on July 22, and finally to the Aldwych Theatre on September 29, where it ran for 167 performances. It has never before been performed in the United States – perhaps due to the fact that the cast includes 22 speaking roles. But it’s the large cast, together with the complexity of relationships among the characters, that makes Peace In Our Time an ideal choice for Antaeus with its 100-plus classically trained members and A2 Ensemble of young professionals. The double-cast ensemble includes 46 actors sharing 22 speaking roles: Josh Clark and Steve Hofvendahl as Fred Shattock; Eve Gordon and Lily Knight as Nora Shattock; Danielle K. Jones and Abby Wilde as Doris Shattock; Jason Dechert and Brian Tichnell as Stevie Shattock; Bill Brochtrup and JD Cullum as Chorley Bannister; Karianne Flaathen and Zoe Perry as Lilly Blake; Drew Doyle and Buck Zachary as Alfie Blake; Emily Chase and Rebekah Tripp as Janet Braid; Anna Mathias and Amelia White as Mrs. Grainger; John Wallace Combs and Philip Proctor as Mr. Grainger; Graham Hamilton, John Francis O’Brien, and Adam Meyer sharing the role of Billy Grainger; Raleigh Holmes and Rebecca Mozo as Lyia Vivian; Daniel Bess and Christopher Guilmet as George Bourne; Jason Henning and Rob Nagle as Albrecht Richter; Mark Doerr and Peter Larney as Dr. Venning; Kendra Chell and Ann Noble as Alma Boughton; Joseph Fuhr and Patrick Wenk-Wolff as Kurt Foster; Etta Devine and Rosalyn Mitchell as Phyllis Mere; Belen Greene and Joanna Strapp as Gladys Mott; Jesse Sharp and Paul Culos as Bobby Paxton; Melinda Peterson and Susan Boyd Joyce as Mrs. Massiter; John Allee and Richard Levinson as Archie; and Chris Clowers as a soldier. Musical direction for Peace In Our Time is by Richard Levinson; set design is by Tom Buderwitz; lighting design is by Jeremy Pivnick; costume design is by Jessica Olson; sound design is by John Zalewski; properties design is by Heather Ho; and the production stage manager is Cate Cundiff. Casey Stangl has directed for theaters across the country including South Coast Repertory, The Guthrie Theater, Denver Center Theatre Company, Actors’ Theater of Louisville’s Humana Festival, Woolly Mammoth Theatre Company, Portland Stage, HERE in New York, The Jungle Theater in Minneapolis and Alabama Shakespeare Festival. 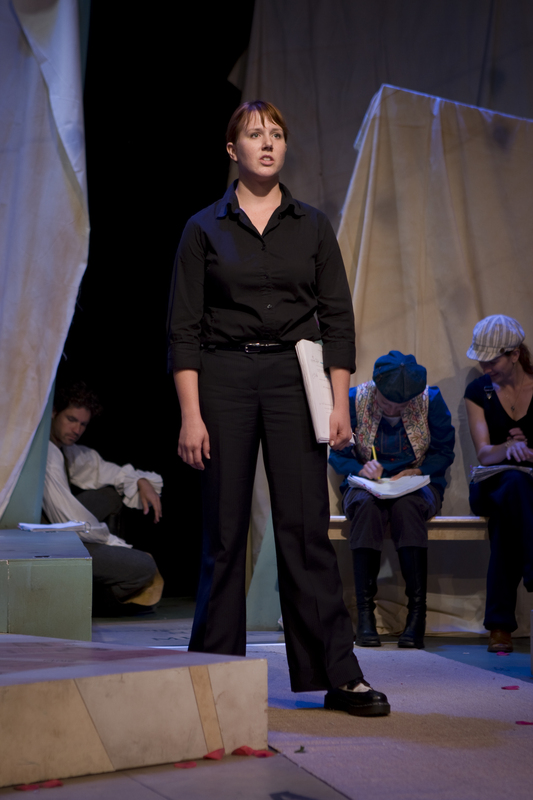 Casey was the founding artistic director of Eye of the Storm Theatre in Minneapolis, a company devoted to new work and for which she was named Minnesota Artist of the Year. She is now based in Los Angeles where her credits include numerous productions at the Falcon Theater, Chalk Repertory’s Flash Festival and the world premiere of Susan Johnston’s How Cissy Grew at the El Portal Theatre, named Best New Play at the 2009 LA Weekly Theater Awards. 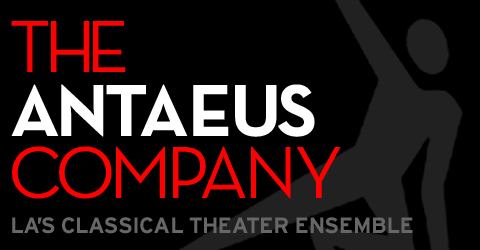 The Antaeus Company strives to keep classical theater vibrantly alive by presenting professional productions with a top-flight ensemble company of actors. Taking their company name from the Titan who gained strength by touching the Earth, Antaeus members – many of whom are familiar to movie and television audiences – regain creative strength by returning to the wellspring of their craft: live theater performances of great classical plays. 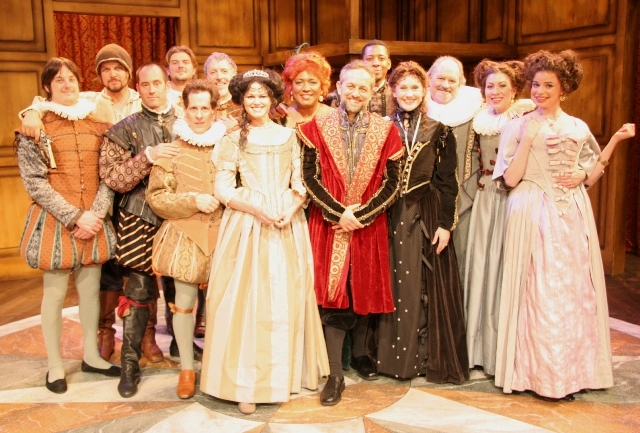 Members of the company and its board span a wide range of age, ethnicity and experience; they have performed on Broadway, at major regional theaters across the country, in film and television, and on local stages, and are the recipients of multiple accolades including Tony, Los Angeles and New York Drama Critics Circle, Ovation, LA Weekly, and Back Stage Garland nominations and awards. Performances take place October 20 through December 11, on Thursdays, Fridays, and Saturdays @ 8 pm and on Sundays @ 2:30 pm except Sunday, October 23 which will be at 4 pm. There will be no performance, on Thursday, Nov. 24 (Thanksgiving). Tickets are $30 on Thursdays and Fridays and $34 on Saturdays and Sundays, except opening weekend performances, which are $40 (Oct. 20 & 21) and $75 (Oct. 22 & 23) and include pre- and post-show receptions. 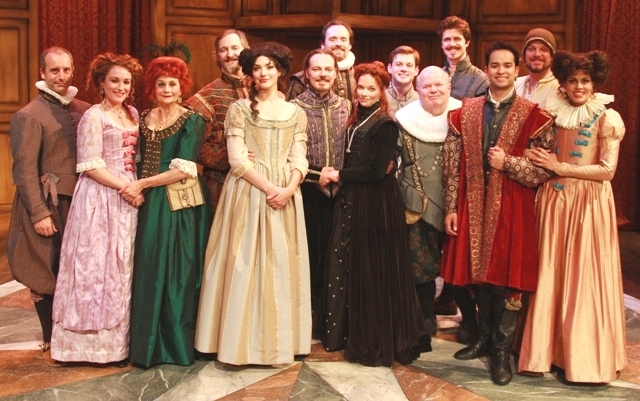 Preview performances take place Oct. 13-19 on the same schedule; tickets to previews are $15. The Antaeus Company is located at 5112 Lankershim Blvd (inside Deaf West Theatre) in North Hollywood, CA 91601. Free parking is available in the uncovered Citibank lot on Lankershim Blvd. just south of Otsego St. The theater is air-conditioned and wheelchair accessible. 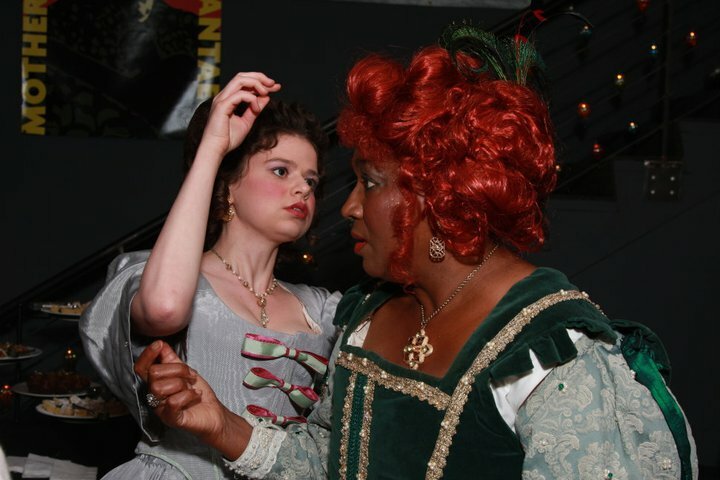 For reservations and information, call (818) 506-1983 or go to www.antaeus.org. Peace In Our Time – The U.S. premiere of Noël Coward’s drama poses a most intriguing and terrifying question: What if the Nazis had successfully invaded and occupied Britain? Set in a London Pub during the 1940s, this new adaptation by Antaeus company member Barry Creyton incorporates 9 of Coward’s lesser-known songs. Tweeting in the Theater.. Yay or Nay? Trying to find innovative ways to market classic theater is no mean feat and it’s something we all struggle with Antaeus. As I was checking in with Kendra Chell, who is appearing in next week’s performance of “Long Day’s Journey Into Night,” our conversation couldn’t help but stray to her day job as Company and Administrative Manager of Antaeus. That means the duty typically falls to her figure out how to attract new audiences to Antaeus shows. If you follow us on twitter, you’ve been following her. In addition to being a talented actress (If you don’t believe me, watch her steal the scenes she has in “Long Day’s…”), Kendra is passionate about Antaeus shows reaching as wide an audience as possible. As the person who sits next to her, I can vouch for how hard she works in pursuit of this goal. One of Kendra’s latest ideas is our Tuesday Night Tweet Night. 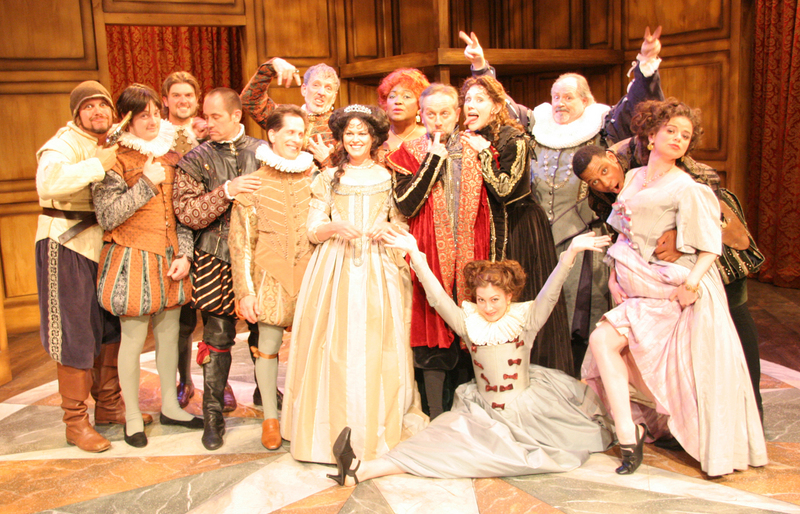 All Tuesday nights during ClassicsFest are Company Nights, open only to Antaeus Company members. These Company Nights are a great way for everybody to come together and support each other’s work. Plus, it’s always nice to have an audience to laugh and cheer during the final dress rehearsal (I accidentally typed “stress rehearsal,” which I think is Freudian.). We’re taking advantage of these evenings, an amalgamation of an actual performance and a rehearsal, to try out live tweeting. Every Tuesday night, we have a crew of Antaeus tweeters, give or take a few special guests, live tweet the performance. This means they tweet their comments on the show as it’s actually happening. Maybe they quote a line, maybe they note a particularly fantastic performance of a scene, maybe they just want to remind all people in the tweetverse that Harry Groener, who is playing Feste in “Twelfth Night,” recurred on “Buffy the Vampire Slayer.” They can tweet whatever they want, so long as they tag it with the hashtag “#cf11” which allows all the tweets to be linked up (Check out Tweeting 101 and Twitter Glossary if this is all Greek to you.). In order to keep disruption to a minimum, all the tweeters sit in the back row, so the light won’t bother other audience members or actors on stage, and they keep the phones on silent. What do you think about Tuesday Night Tweet Night? We’d love to hear your thoughts! 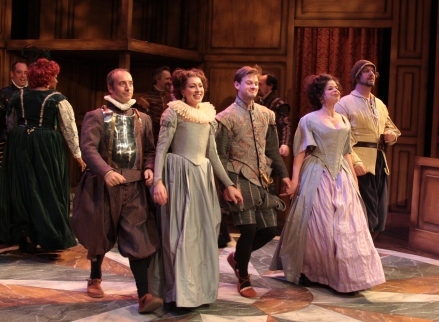 And if you’re interested in becoming a Tuesday Night Tweeter, please DM our twitter account @AntaeusCompany. Opening ClassicsFest 2011 is The Doctor’s Dilemma, George Bernard Shaw’s take on whether or not medicine should be a profit-driven business. Over one hundred years later, the debate is still raging and we’re thrilled to present Shaw’s perspective. 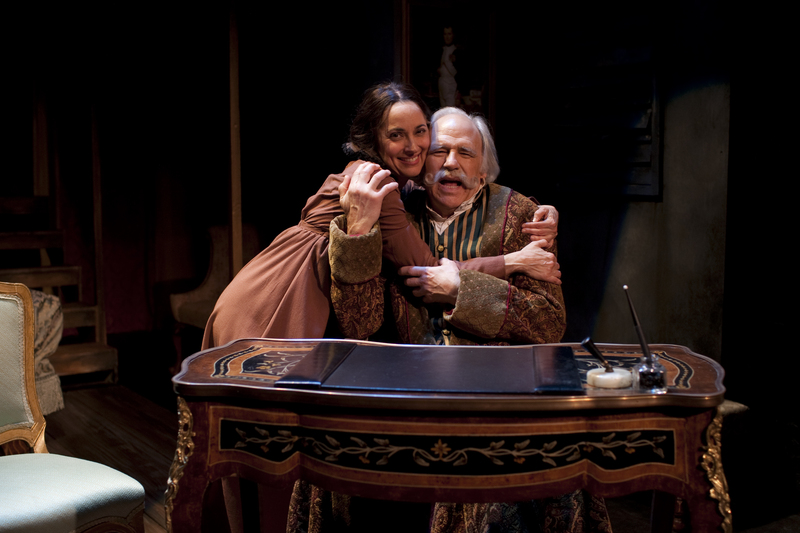 Featured in this production is Antaeus Company Member, Robert Pine, pictured at left with Nike Doukas in last season’s Cousin Bette (photo by Michele K. Short). Robert’s impressive career encompasses work on stage, in film and in tv, but he is probably best known to audiences as Sgt. Joe Gertraer from CHIPS. In The Doctor’s Dilemma, Robert plays Sir Patrick Cullen, a distinguished doctor, skeptical of his friend and fellow physician, Sir Colenso Ridgeon, and his supposed cure for consumption. I spoke to Robert about his experience thus far working on a ClassicsFest Work in Process. He noted that, “as opposed to a full out production, the approach is basically the same except for the obligation to memorize the lines which in regards to time is a significant difference.” Learning lines is definitely not one of Robert’s favorite activities, but working on the show script in hand doesn’t keep Robert or the rest of the cast from going in depth with the play. As Robert describes it, “exploring the text is always the first thing in any consideration of a play and Antaeus has always stressed the text which is why I like working with this company so much. Usually when we start we sit around a table and slowly go through the play and stop frequently to ask questions and explore whatever might arise. That could be a discussion of the period, the particular customs, the language or the ideas which the text stimulates. Anything is up for grabs. I have always loved this part of the process.” The great thing about ClassicsFest is the depth of the process for these workshop productions. Antaeus actors don’t do anything halfway and part of the thrill of seeing a Work in Process is the ability to focus on the world class acting, with few distractions. In short, to use Robert’s own words, “The Doctor’s Dilemma deals with timeless issues such as class differences, the super-inflated egos of self important men and hypocrisy. All are put on a skewer and roasted by Shaw’s considerable wit and intelligence. All of this contributes to a very enjoyable journey.” I personally can’t wait to take the journey of The Doctor’s Dilemma – and the journey of ClassicsFest 2011! It’s going to be a great summer. At approximately 5:30 on Sunday, June 19th, JD Cullum spoke the closing words of THE MALCONTENT for the last time. 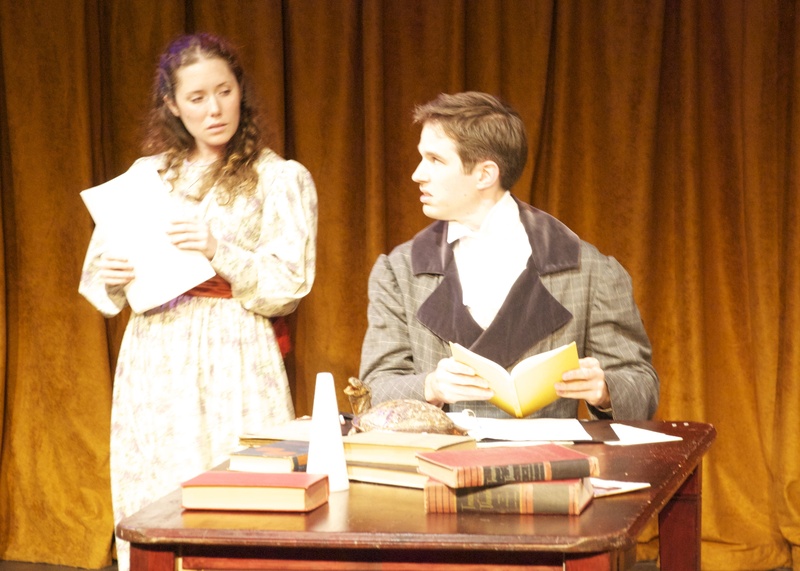 As the Cuckolds cast had the honor of the first opening performance of THE MALCONTENT, it seems only fair that the Wittols had that of the last show. The beginning of that afternoon had a slow and heavy quality about it as the Wittols cast assembled at the theater for the final time; I don’t think I’ve ever seen us less frenetic than that, lounging about, lethargic and depressed, awaiting the final dance call at 45 minutes before curtain. In shows past, nearly all the men would be fully dressed by then, and the women wearing wig-caps, corsets, and petticoats at the very least, and we’d run through our dance-steps at a full sprint; this time it seemed none of us had yet discarded our streetclothes, and I could have sworn we’d all only just rolled out of bed as we ambled onto the stage and nodded hello to one another. Matters were hardly helped by the computer in the sound booth which elected to crash in lieu of playing our music for us. But Deirdre Murphy (Artistic Coordinator for Antaeus, and our third in a line of stalwart stage managers) managed to get the beast cooperating again, and at last, the last of all dance calls began. It is at this point that I must pause my play-by-play of that afternoon. You see, the moments before the cast clears the stage and the auditorium is opened to the audience are sacred and private, and really oughtn’t to be laid open to the viewing public in a medium so mundane as a mere blog. Exposing these things in cold detail would be a sin comparably egregious to denouncing Santa Claus to a room full of sick orphans. The naked truth is that the moments a cast has onstage together before the audience sees them are a powerful brand of secret magic. These are, to tell bare fact, the moments of camaraderie that separate the actor from the spectator, the moments of raucous laughter that fuel the opening scene, the moments that reinforce our united efforts to breathe life into the words of a playwright long dead but not to be forgotten. …These are the moments that at least one of us has incriminating pictures of (Laura), and which, even now, send me into crippling bouts of giggles. The last performance in any run is a cast’s last chance to give the audience, and each other, a well-told story, and I think we really made it count; as the final show unfolded, it became clear that we had all truly brought our last show with us to the theater. Our responses to each other were raw and unexpected, and the actors spoke their lines with an honesty and reality that belonged to the first time rather than the last. The audience was quick and generous with their laughter, and easily kept up with us as we navigated the complex twists and turns of Marston’s dialogue and plot. My favorite moment of the show was, as it has always been, that fabulous little sigh of appreciation that sometimes escapes the entire audience as they hear the final rhyming couplet of the play, just before the applause rings out; that’s when I truly feel we have been successful. Somehow, it’s more honest than applause all by itself. 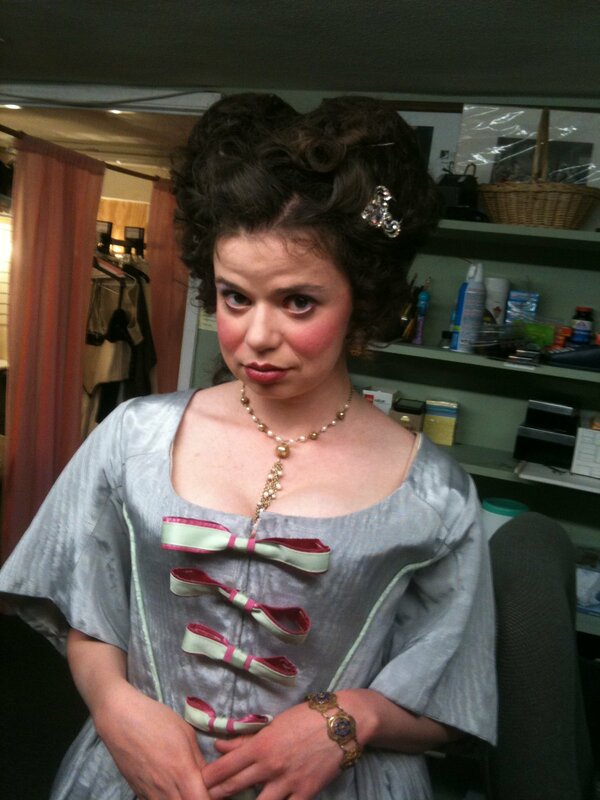 We took our bows and filed offstage, where we unlaced our corsets and rolled down our tights for the last time. 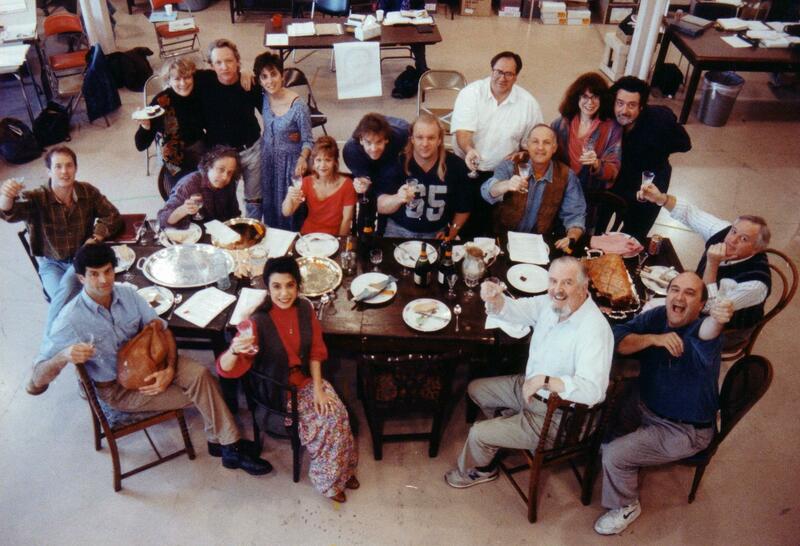 After the show, we filled the library with food, friends, and lots of wine late into the night to give THE MALCONTENT a proper send-off into Antaeus history. Then, one by one, we left the theater as we had arrived: lethargic and depressed. The post-show slump is an inevitable consequence of a career in theater; the next few weeks for many of us will be punctuated by irritability, manic energy, intensely anti-social and ultra-social behavior, and ridiculously large tantrums over ridiculously small things as we struggle to re-adjust to a life without the play. Luckily, many of us have Classicsfest looming on the horizon to keep us from going utterly insane, but that does not completely mask the fact that THE MALCONTENT is over and done. As you can no doubt tell, I’m intensely proud to have been a part of this play. It was no small feat to bring this show to life and could only ever have been so well accomplished by the best and brightest creative minds in town. I count myself extremely lucky to have worked among them. We were blessed with a patient yet firm director, a deliciously lavish and innovative design team, a brilliant and indispensable backstage crew, and a crowd of some of the most intelligent, talented, and all-around fun actors one could ever possibly find. What a pity and a joy that theater is a timeless but temporary art form; though the message of the play itself and the memory of having performed it is untouchable by time, the performing of it must and has come to an end. Though we are not saying ‘goodbye’ to each other, the sad truth is that we must say goodbye to these words and the characters who said them. A2 Ensemble Member, Abby Wilde, shares her experiences working on our production of The Malcontent. This is the final installment.